Manchester United made it eight wins out of eight under Ole Gunnar Solskjaer and progressed into the last 16 of the FA Cup with an ultimately comfortable victory at the Emirates. Injuries to both starting centre-backs – Sokratis and Laurent Koscielny – certainly didn’t help the Arsenal cause, but the hosts were unable to deal with a dangerous United forward line throughout. Romelu Lukaku, restored to the starting line-up, was integral to both opening goals, playing in Alexis Sanchez for the opener before cutting back for Jesse Lingard to double the advantage moments later. Pierre-Emerick Aubameyang continued his good run to pull one back just before half-time, but United weathered the Arsenal storm in the second half and secured their safe passage when substitute Anthony Martial knocked in a rebound late on. 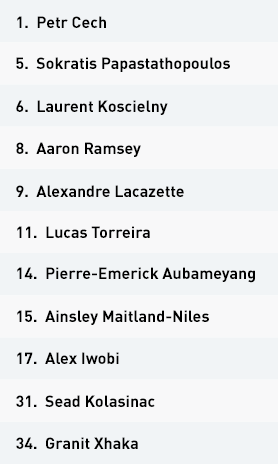 Arsenal set up in a 4-2-3-1 attacking structure, with Aaron Ramsey as the central number 10 behind Alexandre Lacazette, and Pierre-Emerick Aubameyang supporting from the right flank. Within Arsenal’s double pivot, Granit Xhaka would drop deeper to the left during their build; this allowed left-back Sead Kolasinac to move higher and support Alex Iwobi. 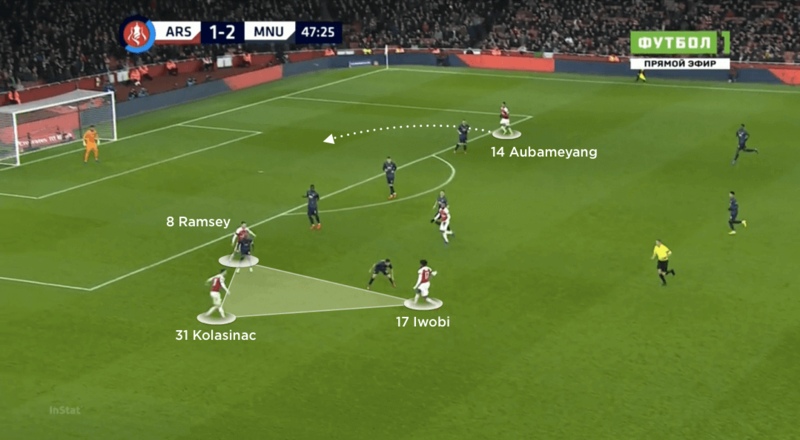 Ramsey, Lacazette and Aubameyang began by alternating their roles, and often attacked as an asymmetrical unit from the right, which gave Iwobi space to attack Ashley Young one-against-one. Ander Herrera eventually moved across to help Young deal with Iwobi, which in turn saw Ramsey move across to attack the space between Young and United’s right-sided centre-back Eric Bailly. With Herrera away from the central lane and Paul Pogba not deep enough to help Nemanja Matic cover, dropping movements from Lacazette became a key link for the hosts. Aubameyang could then attack from the right, with blindside runs for cut-backs or in behind at the far post. 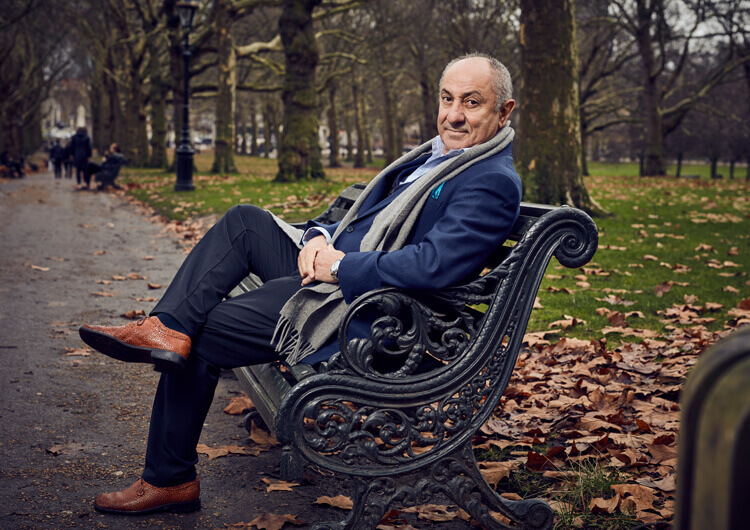 It was from here that the Gabon captain scored Arsenal’s only goal of the game from Ramsey’s cross late in the first half – sadly for the hosts, they were already two goals down at the time. Injury to captain Laurent Koscielny – centre-back partner Sokratis had already been replaced by Shkodran Mustafi in the first half – meant Unai Emery had to adapt his formation. Mesut Ozil and Matteo Guendouzi were introduced into what became a 4-4-2 structure, with Xhaka dropping alongside Mustafi in the back line. Ozil and Ramsey moved between the lines to support the two wider strikers, but Arsenal struggled to break down United’s compact 4-5-1 defensive block and were unable to find an equaliser. Out of possession, the hosts initially set up with a deep 4-4-1-1 mid-block, which helped them both deal with aerial balls into Romelu Lukaku and reduce the space in behind for him to run into. Arsenal aggressively pressed the second ball as and when Lukaku looked to connect with his central teammates. 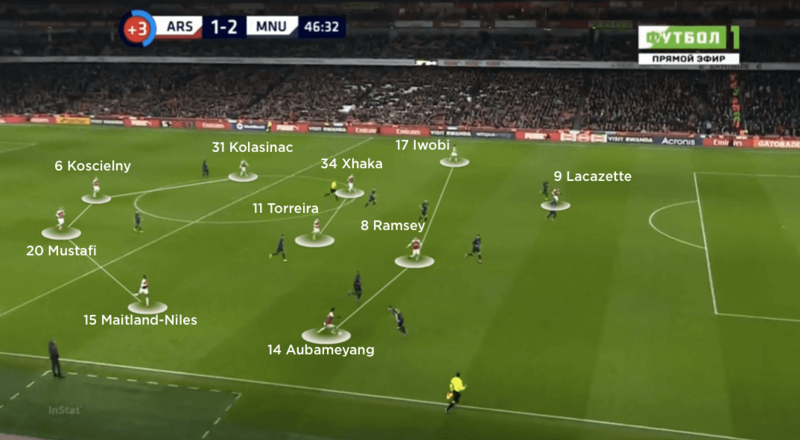 By dropping wide attackers Aubameyang and Iwobi into the midfield four, Arsenal had more security against United’s wider players, with both Lukaku and Sanchez running from in to out and collecting balls down the line. However, this made the hosts less effective during attacking transitions, as their two fastest and most direct dribblers were too deep to penetrate with the ball. 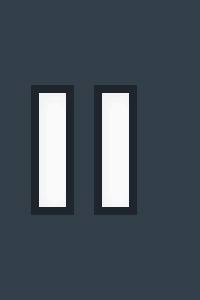 In the end, Arsenal were outdone twice in quick succession by direct transitional play. United’s opener came as the hosts failed to stop Lukaku linking with Sanchez after receiving a long ball, while the second came from intelligent and brave positioning from the forwards to stretch the Arsenal back line both horizontally and vertically. An early pass in behind set Lukaku away, who this time cut back for Jesse Lingard to finish calmly. Arsenal continued to push their full-backs forward in the second half, but after moving into a 4-4-2 they looked more susceptible to counter-attacks. United’s forward play was far less incisive than it had been in the first half, but the danger was always there and Martial finally sealed the victory for the visitors late on. Arsenal now have only one chance of silverware this season, in the Europa League. 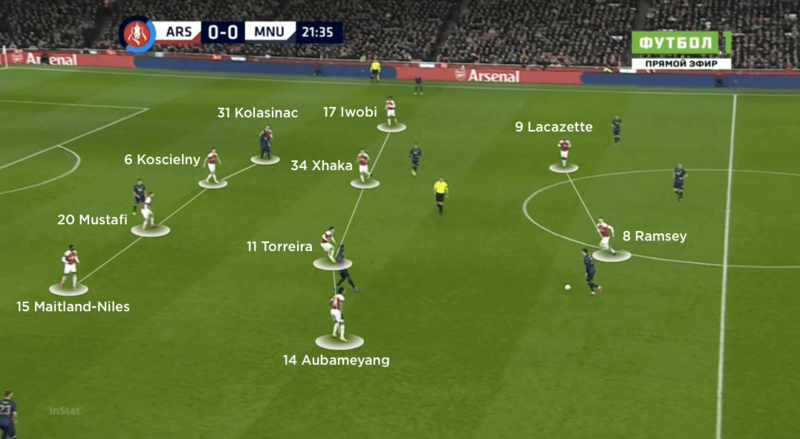 Arsenal attacked in a 4-2-3-1 structure, with Aaron Ramsey often moving across from the number 10 position to support Alex Iwobi or Pierre-Emerick Aubameyang in wide positions. 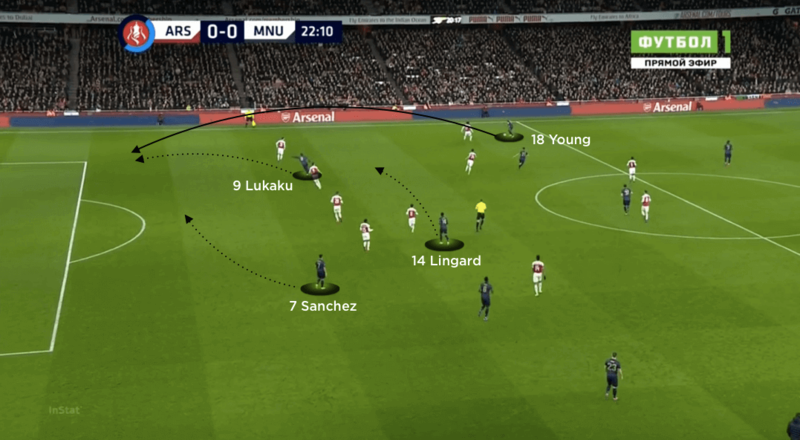 Without the ball, the hosts dropped into a 4-4-1-1 mid-block structure, aiming to defend the central space around the likes of Alexis Sanchez and Romelu Lukaku. The Gunners were more productive on their left, with Ramsey moving across to help Iwobi and Sead Kolasinac create the overload. 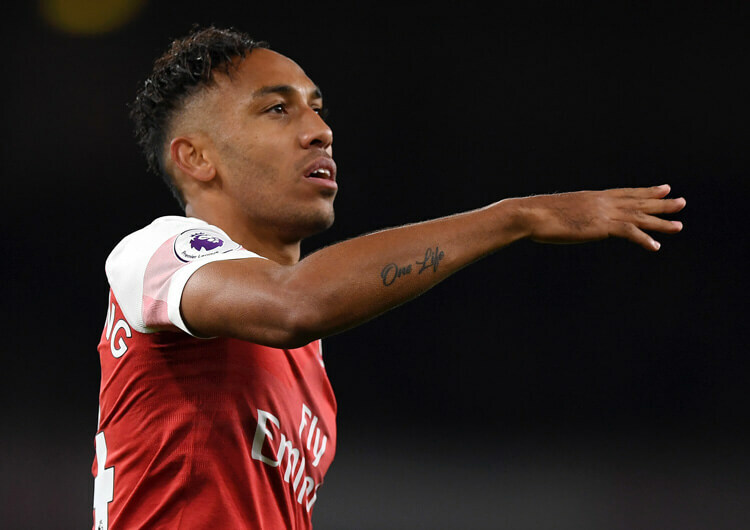 Until Jesse Lingard permanently moved back to support his teammates, Arsenal created a number of chances from this side – including that from which Aubameyang scored. In possession or on the counter-attack, Manchester United consistently looked for Lukaku in behind. Supporting movements from Sanchez and Lingard would overload their right side – a tactic that led to both their opening goals. 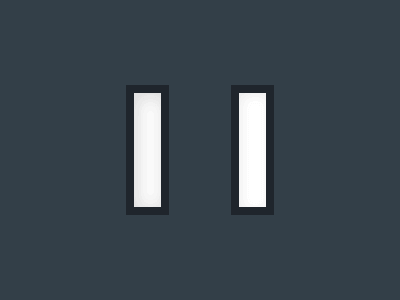 The visitors set up in a 4-4-2 diamond without the ball. Lukaku and Sanchez operated as split-strikers to attack the spaces in behind Arsenal’s advancing full-backs. 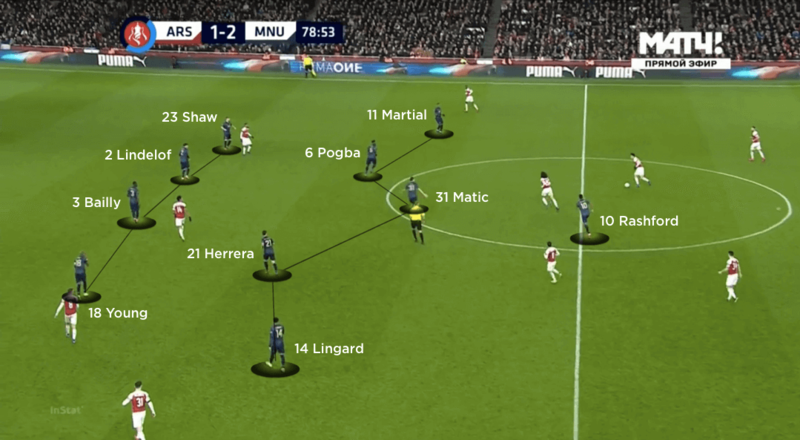 To create additional space for counter-attacks, and simultaneously frustrate Arsenal’s attacks, United used a 4-5-1 defensive structure in the second half. Lingard, Marcus Rashford and goalscorer Anthony Martial were all fast runners on the break. Manchester United set up in a 4-4-2 diamond formation, with Jesse Lingard at the head of the diamond and Romelu Lukaku paired with Alexis Sanchez up front. Both looked to make inside runs from wider starting positions– Lukaku on the right, Sanchez on the left – on the counter-attack, although as the Arsenal full-backs initially remained deep this didn’t prove much of a threat. During prolonged spells of possession, United still prioritised balls in behind the Arsenal defence, even if space was limited. Rotations between Lukaku and Lingard on the right proved an effective way of controlling longer passes forward and then connecting with runners such as Paul Pogba and Sanchez from the left.  The visitors took the lead with this exact pattern, as Lukaku secured the long ball forward and played in a beautifully disguised reverse pass for Sanchez in behind the defence – the Chilean was able to round Petr Cech and finish smartly. A quick and incisive counter-attack doubled United’s lead within two minutes. Arsenal’s full-backs were unable to provide attacking support and then cover Sanchez and Lukaku’s threatening movements. The centre-backs, worried about the balls in behind, were forced to remain deep – which allowed Lingard to find the enhanced central space from his deeper starting position, from where he calmly slid home from Lukaku’s cut-back. United’s second-half transitions lacked the pace and directness of those in the first period. Lingard and Pogba often swapped roles when pressing, but the visitors’ link-up play on the break was less accurate and contributed to a messy period of play during which neither side was able to create anything on goal. Pogba’s strength and intelligence helped draw a number of free-kicks high up the pitch, which worked to frustrate Arsenal as they went after an equaliser. 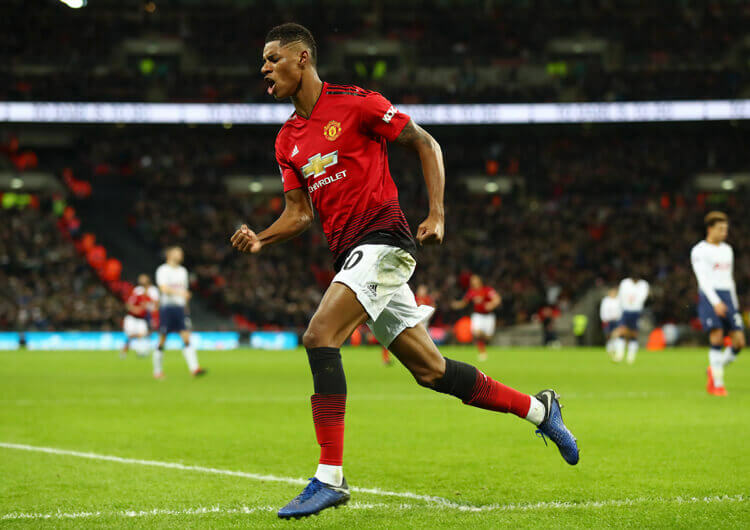 The introductions of Anthony Martial and Marcus Rashford added even more pace and directness on the counter-attack, and it was no surprise when one of them – in this case, Martial – was on hand to turn home the rebound from Pogba’s low effort on the counter-attack late on. Out of possession, the visitors created a diamond 4-4-2 defensive mid-block, often leaving Sanchez and Lukaku higher as split-strikers, with Lingard dropping deeper within the central lane. This allowed them to quickly counter in behind Arsenal’s back line, with both forwards ideally positioned for early forward passes. With Arsenal attacking mostly down their left side, Ander Herrera consistently moved across to support Ashley Young at right-back, either to create an overload against Alex Iwobi or reduce the threat of the overlapping Sead Kolasinac. United rarely pressed Arsenal’s back line, as they wanted the hosts to sustain the ball for longer spells. The longer Arsenal had the ball, the more advanced their full-backs – Kolasinac in particular – would become. While this occasionally forced the visitors into a low block, it crucially gave them the ideal spaces to attack on the counter. An ill-judged high press from the visitors’ front line led to the only goal they conceded on the night. With the defence not stepping up to maintain equal distances between the lines, Arsenal were able to attack the space at speed; Kolasinac and Ramsey again combined on the left, with the latter sent clear to cross for Aubameyang to finish at the far post. 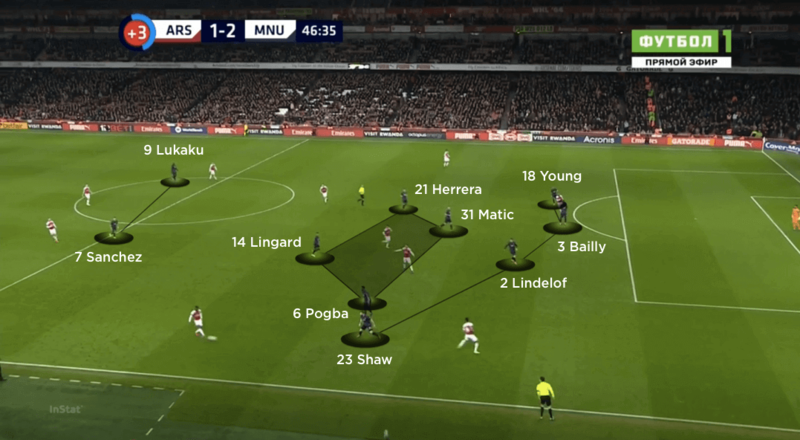 United continued to struggle with Arsenal’s left-sided rotations, with Ramsey’s supporting runs in particular causing issues for both Young and Herrera. 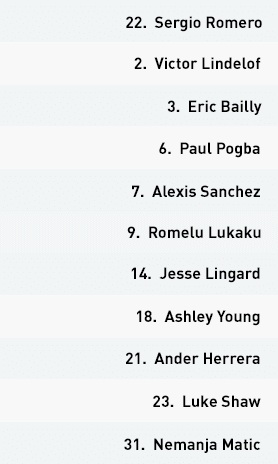 Head coach Ole Gunnar Solskjaer eventually moved Lingard out to the right side of midfield in a repurposed 4-4-2, with Lukaku moving more central. 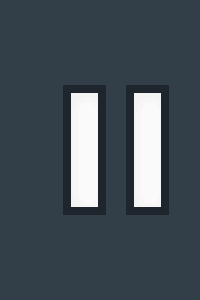 From here, the visitors found greater defensive stability while retaining an offensive threat on the break – as such, they saw out the game and moved into the last 16 with few concerns.